The Shenzhou 7 manned spacecraft launches from the Jiuquan Satellite Launch Center in northwest China's Gansu province on Thursday Sept. 25, 2008, in this photo distributed by the official Chinese news agency, Xinhua. China has successfully rocketed three astronauts to space ona mission set to include the nation's first spacewalk. The Shenzhou 7 spacecraft launched around 9:10 a.m. ET (1310 GMT) aboard a 19-story Long March 2F rocketfrom Jiuquan Satellite Launch Center in China's Gansu province. The mission marks China's third manned spaceflight, fiveyears after its initial 2003 liftoff. The nation is only the third country,after the United States and Russia, to independently launch people into space. "For those who are just tuning in, it is a statementthat China is a space power that needs to be reckoned with," Dean Cheng,China analyst with Alexandria, Va.-based think tank CNA Corp. told SPACE.combefore launch. Zhai Zhigang, Liu Boming and Jing Haipeng, all 42-year-oldChinese fighter pilots, are China's first three-membercrew to journey to space. "The successful launch marked the first victory of the Shenzhou-7 mission," Chinese president Hu Jintao said after launch, Xinhua reported. "On behalf of the Party Central Committee, the State Council and the Central Military Commission, I'd like to extend warm congratulations to all work staff and army forces participating in the mission." The planned five-day mission is due land in Inner Mongoliaon Sept. 28. The mission is slated to include a 40-minute forayinto space for one of the three Chinese astronauts, or taikonauts. Duringthe activity, which could happen Friday or Saturday, state media reported, thespacewalker is set to retrieve scientific experiments placed outside thespacecraft and deploy a small satellite capable of sending images back toEarth. The spacewalk will be a test of China's technologicalprowess, especially its newly built Feitan spacesuit, which reportedly cost 30million yuan (about $4.4 million). The suit is designed to provide apressurized atmosphere, oxygen and temperature control, and communicationability. It also protects astronauts from radiation, micrometeoroids and otherharmful particles in space. China hasannounced plans to broadcast the spacewalk live, in a gesture of confidenceand transparency. The Chinese spacewalkers are due to be "supported byRussian experts throughout the mission," the Associated Press quoted WangZhaoyao, spokesperson for China's manned space program, as saying. "Thesuccessful cooperation on the Shenzhou 7 manned mission will create favorableconditions for future cooperation between our two countries." The Shenzhou spacecraft itself is based on Russia's Soyuzvehicle, but modernized by Chinese engineers. The Chinesespacecraft includes an orbital module, a crew compartment, and a servicemodule that houses propulsion and other vital systems. Only the crew-carryingsection is designed to return to Earth intact. A successful spacewalk would be an important step towardChina's goals of building an orbiting space laboratory and possibly even landingon the moon one day. "It's another step along the way," Cheng said in atelephone interview. "The issue is not just the EVA [spacewalk], but theability to actively operate in space." 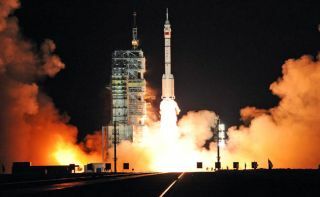 The Shenzhou 7 flight follows the successful October 2005launch of China's Shenzhou6 mission, which took two Chinese astronauts into space for five days. Thenation's first manned spaceflight, the 2003 Shenzhou 5 mission, made China thethird country ever, after Russia and the United States, to independently launcha person into space.